Heather Dyer and Steve Pierce, chemists at Maine CDC’s Health and Environmental Testing Lab, recently presented on toxicology forensics at the Maine Impaired Driving Summit. 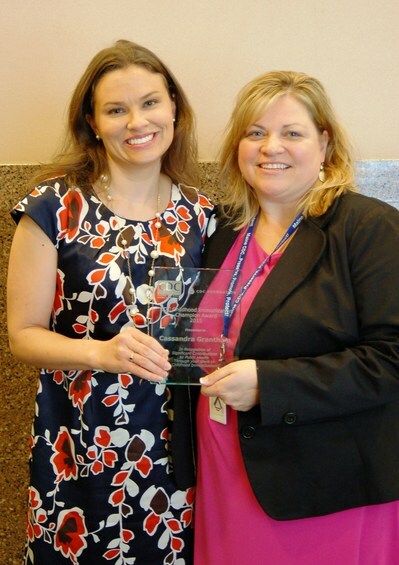 They were recognized by AAA Northern New England and Maine Bureau of Highway Safety for their support in organizing the statewide summit. May is National Hepatitis Awareness Month, and Maine CDC urges people to talk with their providers about testing for hepatitis. US CDC reports that people born from 1945 through 1965 are five times more likely to be infected with Hepatitis C than other adults. There are approximately 3.2 million individuals living with hepatitis C in the country, and it is estimated that 75 percent of these individuals are Baby Boomer age (ages 50 to 70). Most people living with hepatitis C do not know they are infected and can live with the disease for decades without having symptoms or feeling sick. If left untreated, hepatitis C can lead to serious liver damage, including cirrhosis and liver cancer. Hepatitis C is the leading cause of liver transplant in the United States. Symptoms of hepatitis C include fever, fatigue and loss of appetite, nausea, vomiting, abdominal pain, darkened urine, clay-colored stools, joint paint and jaundice. It is estimated that only 20 to 30 percent of individuals who have Hepatitis C experience symptoms. People who have ever injected drugs, shared needles and equipment, or who were born to a Hepatitis C positive mother join Baby Boomers in the highest risk category. Recent advancement in therapies for treatment of hepatitis C can cure up to 95 percent of infections. Maine CDC recommends that people talk to their health care provider about their risk for hepatitis C.
Those who are interested in being tested should call the test site prior to the testing day to find out if they qualify for the free test. From left to right-Ken Albert, Director and Chief Operating Officer, Maine CDC; Kyle Poissonnier, founder of Katalyst; MaKayla Reed, volunteer for The Trevor Project; Jodi Beck, Director of Clinical Integration and Physician Practice Improvement for Kennebec Regional Health Alliance, MaineGeneral Health; Anthony Ronzio, Director of news for the Bangor Daily News; Kristen McAuley, Team Lead, Healthy and Safe Living, Division of Population Health, Maine CDC; Brian Walsh, Principal of Hermon High School. CAL ME Award recipients not pictured- Ethel Jalbert and Tonya Bailey-Curry, community volunteers. More than 200 people attended the Maine Suicide Prevention Program’s conferece, 2015 Beyond the Basics: Pathway to Suicide Prevention, last week. 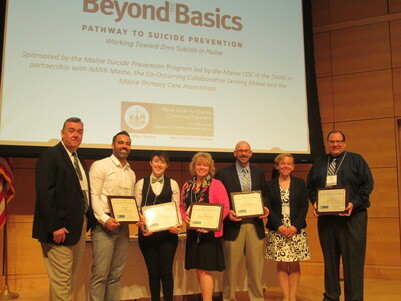 Ken Albert, Director and Chief Operating Officer of Maine CDC, presented the Caring About Lives in Maine Awards to seven Individuals and agencies for their leadership and dedication to suicide prevention.